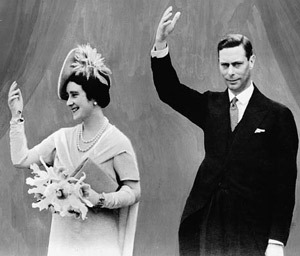 It was Elizabeth, the Queen Mother who first made the appointment that was to change the King’s life. There is no mention of Freemasonry in the Oscar-winning film that tells the true story of how King George VI battled a confidence sapping stammer, writes Masonry Today journalist, Paul Hooley. 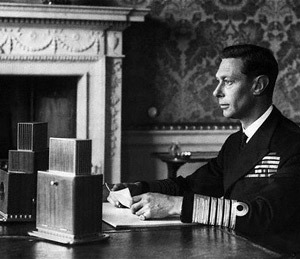 ‘The King’s Speech’ has been critically acclaimed as one of the finest motion pictures of recent years and has renewed the public’s interest in, and affection for, King George VI, who reigned on the throne of Great Britain through its darkest years from 1936 to 1952. Oscar©-winner, Colin Firth (George VI), acts alongside Geoffrey Rush (Lionel Logue) in ‘The King’s Speech’. The movie, which chronicles the constitutional crisis created by Edward VIII’s abdication, George’s take-over and his struggle to overcome his severe stammer, focuses on the moving relationship between the King and speech therapist, Lionel Logue, (see Logue Famous Freemasons A-L) which had such a positive ending: the King and the commoner remaining firm friends for life. What the film fails to mention, however, is that both men were members of the Craft; and that the King believed Freemasonry was forefront in assisting him to overpower his speech impediment – a disability that rarely surfaced whenever he performed Masonic ritual. 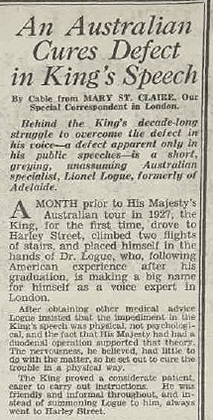 Logue, who had been the Master of St. George’s Lodge, Western Australia, was also speech therapist to the Royal Masonic School. An extract from 2 January 1937 edition of The Australian Woman’s Weekly. After service with the Royal Navy in the First World War, he was initiated in December 1919 into Navy Lodge, No. 2612, his grandfather, King Edward VII, having been founding Master. On that occasion he noted: “I have always wished to become a Freemason, but owing to the war I have had no opportunity before this of joining the Craft.” From that moment he became a most dedicated and active Mason. He was invested under his real name as Albert, Duke of York in 1920 and the following year installed as permanent Master of Navy Lodge. He joined other lodges and degrees and was appointed Senior Grand Warden of the United Grand Lodge of England in 1923. Following World War II, King George wrote that: “Freemasonry has been one of the strongest influences on my life” and in collaboration with engraver Reynolds Stone helped create a postage stamp, part of the ‘1946 Victory Issue,’ which is filled with Masonic symbolism. Very collectable: The blatantly Masonically influenced Royal Mail 3 penny ‘Victory Stamp’ from 1946, designed by King George VI. 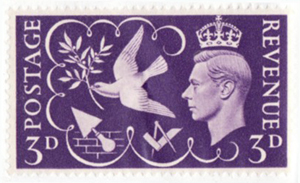 The 3 penny Victory Stamp was widely praised for the “strength and simplicity of the design.” It depicts the King’s head in the East, his eyes firmly fixed on illustrations of a dove carrying an olive branch (representing peace and guidance), the square and compasses (configured in the second degree) and a trowel and bricks (the sign of a Master spreading the cement that binds mankind in brotherly love). King George suffered utter anguish prior to making any speech in public, but felt duty-bound to try. Footnote: A simply captivating film, ‘The King’s Speech’ won the Academy Award© for Best Picture of 2011. 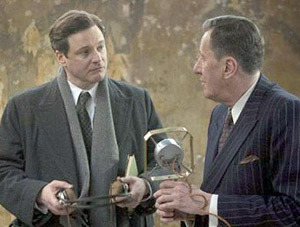 For his portrayal of King George VI, Colin Firth won the coveted Best Actor Oscar©, along with Academy Awards for Best Director (Tony Hooper) and Best Original Screenplay (David Seidler).